Oh Canada! smells amazing. It smells exactly as one would expect a Canadian-themed tea to smell – like maple syrup. Somewhere along the way, maple syrup just became the thing that is associated with Canada. Sadly, this tea does not also smell like poutine, but the cute maple leaf candies sprinkled throughout the tea more than make up for that. I really enjoy smelling this tea, it doesn’t smell like the maple syrup “products” that are more water than syrup, it smells like the maple syrup I’m used to. Oh Canada! is made up of: red and green rooibos, honeybush, caramel, toffee, candy leaves, natural and artificial flavouring. For those with allergies or sensitivities, Oh Canada! has milk, soy, and almond in it. DavidsTea recommends near-boiling water for 4-7 minutes. Those temperatures, according to their website, are 90-95°C (194-203°F). I steeped mine in just boiled water for close to 6 minutes. Oh Canada! 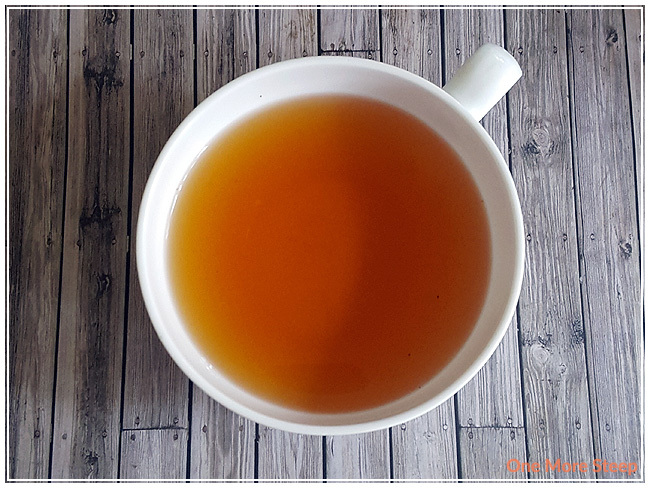 smells like strongly of rooibos, with hints of maple syrup and caramel after it has steeped. 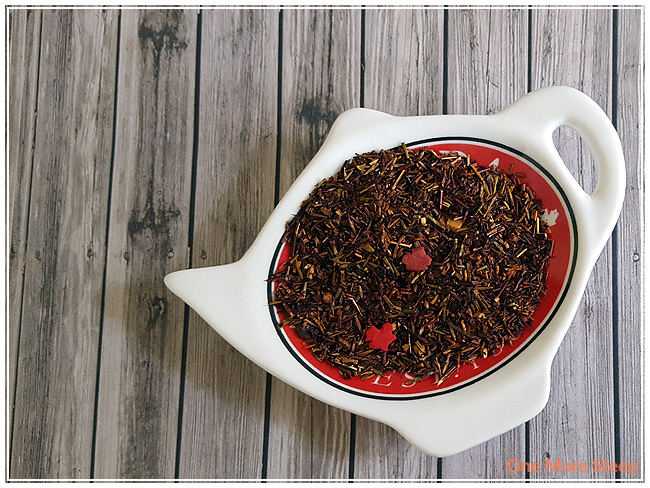 This patriotic rooibos steeps to a lovely reddish brown that I’ve come to expect from rooibos based teas. There’s a very pleasannt taste to it, but it is primarily rooibos rather than maple syrup and caramel. Despite the added sources of sugar (maple syrup, maple leaf candies), it isn’t very sweet. I added a little bit of sugar into my cup of Oh Canada! and I found that the maple flavours became more pronounced with the addition of a sweetener. Based on the nature of this tea and the use of flavourings and candies, I did not resteep Oh Canada! 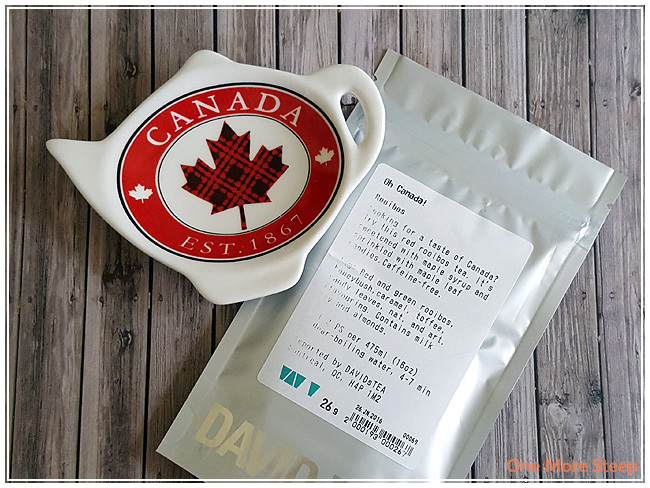 I thought that DavidsTea’s Oh Canada! was just okay. I love the idea on a patriotic, maple syrup tea more than I actually liked drinking Oh Canada! I really wanted to love it for all the reasons that I love Canada, but the fact remains that the rooibos base overpowers the maple syrup flavouring without additives on my part. I think this tea does well with the addition of a sweetener, and if you want to taste more of the maple flavouring I would recommend using a little bit of sweetener. One More Steep is Back!